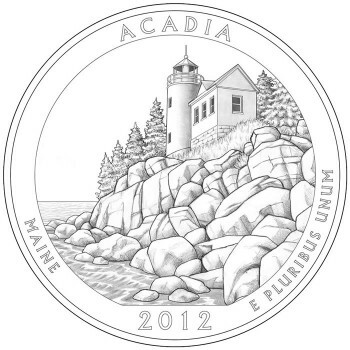 The third coin to be released in 2012 as part of the U.S. Mint’s America the Beautiful Quarters® Program is the Acadia National Park Quarter, honoring the site in Maine. Scheduled with a release date of June 11, 2012, it is the thirteenth strike to launch since the beginning of the program in 2010. Along with the designs for the other 2012 America the Beautiful Quarters, the U.S. Mint released an image of the final design for the reverse of the Acadia National Park Quarter on December 8, 2011. This happened after the Citizen’s Coinage Advisory Committee (CCAC) and the United States Commission of Fine Arts (CFA) considered several design candidates for the quarter. The Treasury Secretary had the final say on the design selection. The obverse of the Acadia National Park Quarter features a portrait of George Washington, the first President of the United States, as designed by John Flanagan. This same portrait is used on the obverse of all of the strikes in the program. 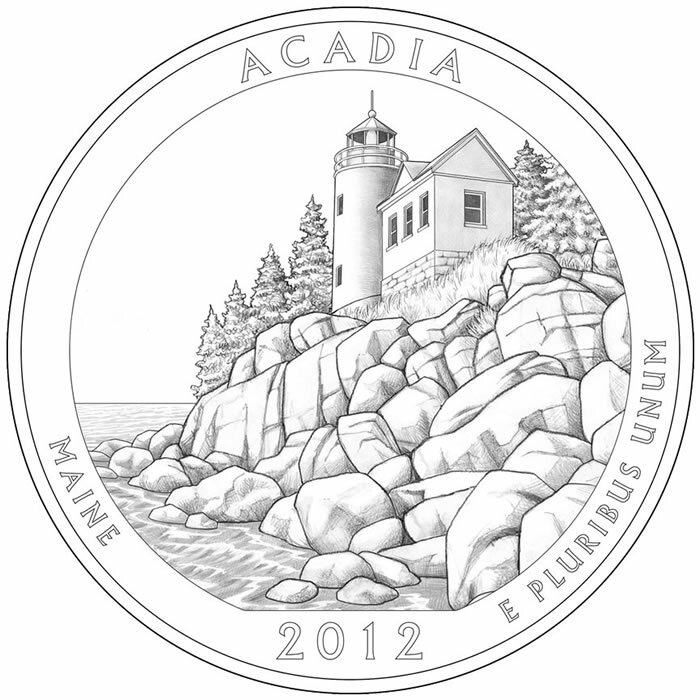 As stated, the Acadia National Park Quarter is the third to be released in 2012, preceded by the El Yunque National Forest Quarter and the Chaco Culture National Historical Park Quarter. Two more quarters will follow the Acadia Quarter, including Hawaii Volcanoes National Park Quarter and the Denali Nation Park Quarter. The United States Mint is also releasing a series of America the Beautiful Silver Bullion Coins which will contain the same basic designs as found on these quarter dollars. Much of Acadia National Park of Maine would not exist if not for the help of philanthropist John D. Rockefeller. He funded many of the park trails and helped rebuild the park after a fire damaged a large part of the forest in 1947. Preserved in the area is a rich cultural history, including that of the Native Americans and the early European settlers. Originally, the park was created as Sieur de Monts National Monument on July 8, 1916, but after many people found out how beautiful the area was, a push was made for more protection. In 1919, it was renamed the Lafayette National Park. Then, in 1929, the name was changed to Acadia National Park. Like many of the parks of the National Park System, Acadia is diverse in its landscapes and animal inhabitants. It is home to shorelines, mountains, forests and lakes, as well as bobcats, dear and other animal species. An interesting fact about Acadia is that it is the first national park east of the Mississippi River.